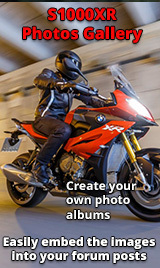 Just found this site, done some reading and already benefitted from one thread sharing info on clutch levers. They are ordered and on their way. Both the wife and I have XRs, myself having taken delivery in July and herself in October. I have already done a Europe trip with mine with some 9k km on the clock already. Thoroughly enjoying the bike and find that it not only meets every expectation set by BMW and the press, but for me exceeds them in every way. I also have a GS LC, which I prefer use when the weather aint great as weather protection is a slightly better, but thats about it for preferences. Think you'll find a bunch on here who are feeling exactly the same about this bike. It's amazing in so many ways. There is 1 problem grnmtvt it will not let me get off just keeps asking to be ridden more. Wish I could get my other half on her own XR or any other motorbike for that reason. Lucky Guy. Isn't it just? The wife has only just started riding hers after getting off the new R1200RS, which for some reason, she just did not get to grips with. Naturally I had discovered this back in June when I took delivery of my own. Tried to convince her for months the XR was good, but hey I am only the hubby and not to be believed at the best of times.